Three new dispensaries and a grower were approved on Monday night, and a processing plant could also be coming soon. The leaders of the planning commission (SMAPC) last week recommended for approval all of the newest medical marijuana sites, and sent them on to the Sapulpa City Council, to be decided. After several discussions, all were approved except for the processing site, which was tabled until the next meeting (Monday, April 15th). 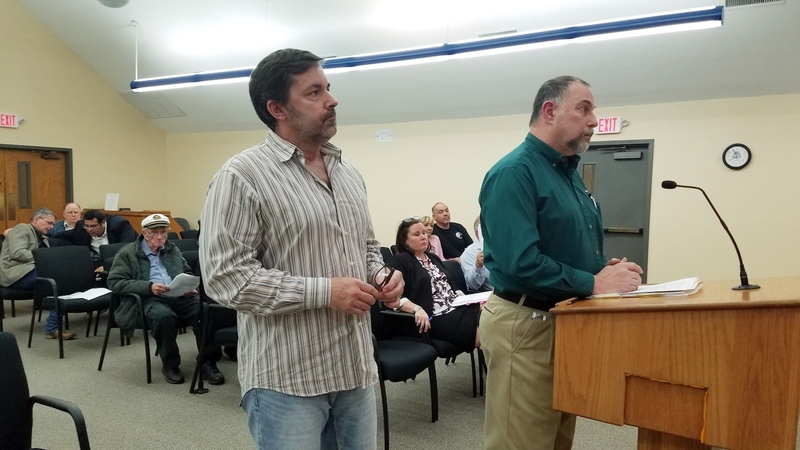 John Sears of Fuego Premium Extracts, LLC, asked for an Special Use Permit for a medical marijuana processing shop, in a rented space that already houses a medical marijuana dispensary on Highway 66. This sign at The Sacred Herb is being accused of being out of compliance because of its use of a Marijuana plant in the graphic. The owners have previously stated that it’s actually an oak leaf. Again, Larry Kenton, a neighbor on Woodbine behind the facility, complained that the original shop was not complying with the provisions of his SUP, mainly because the “privacy fence” was missing from the backside of the property and the “screen” on the chain link fence was not opaque, as it was supposed to be. Further, Kenton testified that the shop also held a race car and he was concerned that oil or fumes could somehow leak into the product. He also remarked that the signage on the original building violates the provisions, since it looked like a marijuana leaf and not any known “oak leaf” as the owner of the building asserted. After extensive and intricate questioning and coherent and knowledgeable answers concerning how the process worked, what was left after processing, and how Sears had learned his craft, the City decided to table the decision until City Manager Joan Riley, owner John Sears, the Fire Marshall, and others could be available for a meeting. Then, one after another, the three medical marijuana dispensaries were quickly approved. The first one was for Brenda Miller, whose building is located at the south end of a strip mall at 7941-A State Highway 66 (formerly New Sapulpa Road). In this strip there are a gas station, convenience store, and a bar at the opposite end. Mayor Green questioned whether it would be a target for “loitering,” which is strictly forbidden in the provisions for dispensaries. Nikki Howard suggested erecting “No Loitering” signs. They expect to be open in a few days. The next dispensary approved is located in the Historic Preservation District at the corner of Hobson and Water Street, in a small shop which is part of a seven-shop strip, and is across a large parking lot from a Human Skills and Resources, a drug addiction treatment center. Ms. Judith Beck is a licensed Alcohol and Drug Abuse Counselor. The next two SUPs (033-A and B) were approved for Paul Franks who doesn’t have his license yet because it is a $5,000 investment, so he wanted to “get past the SUP process” before spending the money. At 8777 State Highway 66, Franks will have a grow facility, in a 6,000 square foot “greenhouse” that is locked and secure with no lights or odor emanating from the building. In public questioning, Mr. Kenton asked the leaders if the odor would show up if someone was stopped on the highway and his car was checked by a K-9 deputy. Would the dog alert on the drugs wafting over from the greenhouse? The consensus among the councilmembers was that the dogs were trained to alert on very specific spots and not by airborne scents. Franks would also operate a medical marijuana dispensary at the same location, but with separate licensing, in separate parts of the building, and separate staffing. On other agenda items, the council approved wholeheartedly the SUP to develop a defunct mechanics shop into a Technical School Facility in the former Davis Manufacturing location. Ultimately, the building will look “exactly like the main building” (Central Technology Center) on South Main Street. It will house a shop and offices. Another item was the approval of short-term rentals at a home owned by Mary Ann McDowell Miller at 603 West Mike Avenue. It is now used as a long-term rental and this SUP allows for short term, from a few days to a few months, in a more comfortable environment than a motel room. “The City of Sapulpa vs. Mohammed Z. Khurshid,” who is the owner of the OK Motel at 508 West Dewey. In the past few months, Khurshid has been in a legal wrangle with the city for owning, living in, and renting out an alleged dilapidated motel. Part of the difficulty with the case has been finding a certified translator of Bangladeshi, the native language for Mr. Khurshid. This court date is Khurshid’s and the City’s opportunity to be heard before Judge Golden. Widdoes said he expected there would be no action until mid-May. The next meeting begins at 7 p.m. on Monday, April 15th, 2019 at City Hall.